It's been a while since last, winter has passed, spring has passed, and now approaching summer again. I'm looking fpr my change !! What's going to happen next !? Kyaaaaa<<<<< My last blog was in August ! I had a Seijo's school reunion the other day. Some look very young and some are old. 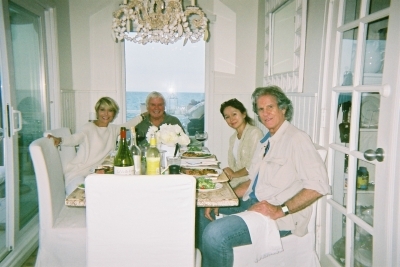 However, whatever, such a pleasurable period to spend with childhood friends. 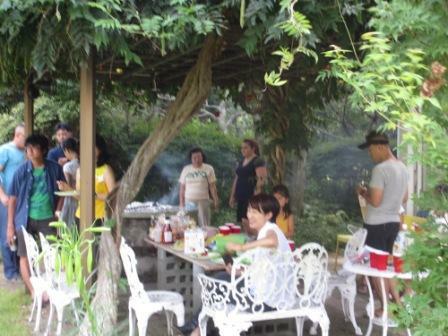 We had summer party with lots of fun games and enjoyed BBQ. 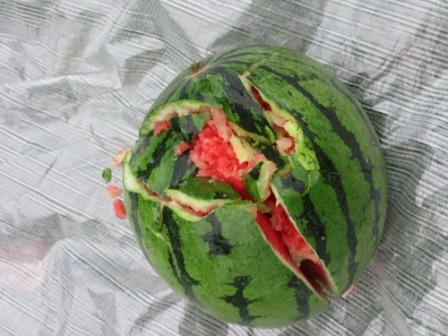 SUIKAWARI ( smash the watermelon ) which is a special attraction of summer in old days Japan. they all came and had a great time having a BBQ at Carol's. I again realized that Lim's boys take very good care of their wives. Kae made a right decision indeed. and didn't work well and still looking for her good mariage. I met a new girl who came to Stanford Medical School to study medicine. She'll rent Carol's downstairs room while she's here. Her parents are also doctors and her sister as well. They are from India. They all looked very bright and sagecious. Her mother and a sister were helping her moving in. Her mother said to me the meaning of maja in India is illusion. This world where we're living is not a real world, it's an illusion. comfortable and close to the meaning. HAF has been held since mid April and finished last week. and MONO-students' mono-print pictures and the post cards' exhibition. The gallery SPACIA had Yoshiko Jinzenji's exhibition. The studio LIFE TREE had a show of Jinzenji & M. Masago's works. Maja's CTC had a Jinzenji's WORK SHOP. I feel like two weeks earlier than usual years . Nyantaro past away on May 1st 2009 and the day was just like today. I had early dinner with my friend at La Maree's cafe last night. She, Michiyo Masago is an out-fit designer more as a textile artist. I first met her at Y. Jinzenji's Hieizan's "kitchen house" opening party. for the exhibition of Jinzenji's in May. One of my frinds Keiko in Portland visited me last week. She's been a school teacher in Portland for long time and recently retired. Anyway, I am most comfortable with an artist. I can be myself.